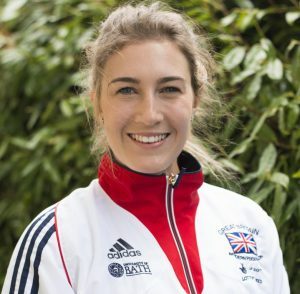 Joanna Muir produced fantastic performances across all five disciplines to finish 5th in the Senior Modern Pentathlon European Championships today with Team GB 2016 Olympians Kate French and Samantha Murray 10th and 17th respectively in Sofia. The three individual performances meant the British trio claimed team silver whilst defending champion Laura Asadauskaite retained the title she won in Bath last year. 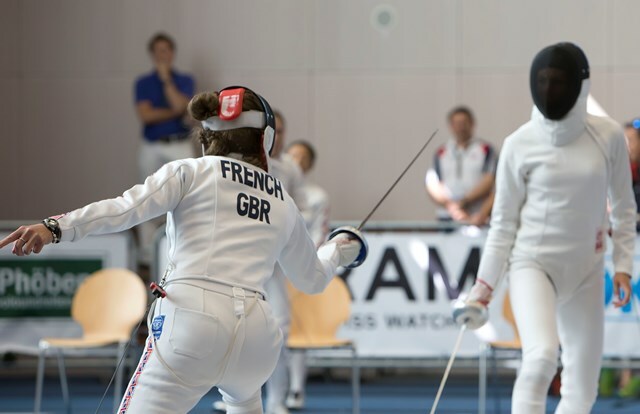 The Women’s final started yesterday (8th July) with the fencing ranking round; French the top Brit with 23 victories and 12 defeats leaving her 5th overnight. European Championships debutant Muir recorded 18 victories to finish the discipline in 12th with London 2012 silver medallist Murray 23rd after securing 15 hits. The trio returned to the competition venue today on another sweltering day in the Bulgarian capital, starting the day with the 200m freestyle swim. All three produced strong performances in the pool with Murray’s time of 2:09.89 the 2nd quickest of the day, moving her up to 10th in the overall standings. 25 year old French’s 2:19.21 and 21 year old Muir’s 2:16.58 meant the duo remained in 5th and 12th respectively after the second discipline. All 3 GB athletes then enjoyed success in the fencing bonus round with Muir winning two bouts to gain an extra two points and French and Murray both picking up a single extra point apiece. In the ride, Muir knocked down a single pole to pick up 293 points with Murray collecting 286 and French 273. This meant Gravesend’s French headed into the combined event in 8th, 41 seconds behind leader Katsiaryna Arol from Belarus. Dumfries’ Muir started a single place and single second behind her GB teammate with Clitheroe’s Murray 6 seconds further back in 13th. A brilliant run-shoot from Muir saw her rise to 5th, a career best performance at major competitions. In a tightly bunched field, French crossed the line 10th with Murray 17th in their final performances before the 2016 Olympic Games in Rio de Janeiro. The three scores combined meant the British trio claimed a silver medal in the team competition. Lithuanian Laura Asadauskaite came from 5th at the start of the combined event to retain her European title with Russia’s Gulnaz Gubaydullina claiming silver and Turkish teenager Ilke Ozyuksel taking bronze. Meanwhile, the Men’s final started with the fencing ranking round with Sam Curry and James Myatt representing GB after qualifying yesterday. Salfords’ Curry recorded 19 victories and 16 defeats to lie 9th overnight with Maidstone’s Myatt 20th after 17 victories. The duo will be back Sunday for the culmination of the Men’s final on the last day of the Championships.